15 of the Best (and Most Offbeat) Attractions in Nebraska! One of the best ways to get a real slice of Nebraska is to map out the more unusual attractions across the state. From the world’s largest ball of stamps to the national museum of roller skating, these aren’t your typical tourist destinations. 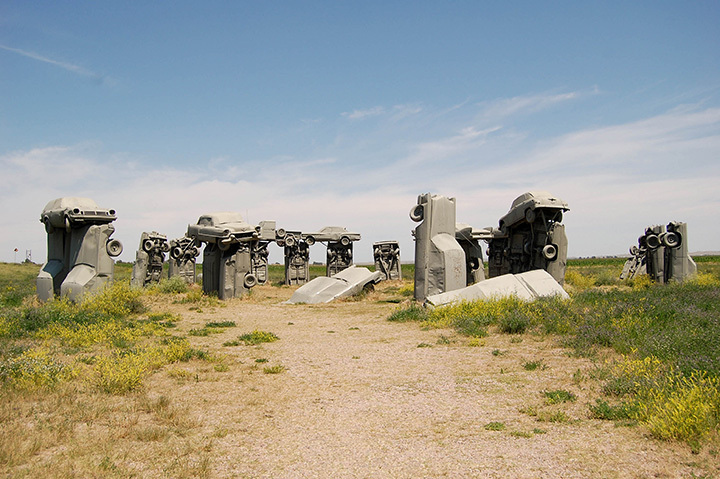 If you’re looking for a chance to go off the beaten path, check out our list of the 15 most unusual attractions in Nebraska. Monowi, Nebraska may be better known as America’s smallest town. The town is home to a single citizen, Elsie Eiler, who not only acts as the owner of Monowi’s only private business but also as the town’s librarian and mayor. The Klown Doll Museum located in Plainview, Nebraska, is home to more than 7,000 clown dolls and claims to be the largest such collection in the world. Giant clowns, clown magnets, and even Christmas trees covered with clown ornaments are all treasures you’ll find here. For lovers of the creepy or the kitschy, this is one odd Nebraskan museum to add to your list. Home to the largest collection of collectible marbles in the world, Lee’s Legendary Marbles in York, Nebraska, features several buildings full of collectibles and over one million antique marbles. This offbeat attraction is well worth a visit, just don’t try counting them. This replication of the famous Stonehenge in England features 38 automobiles positioned to mimic the rocks that make up the real Stonehenge. All the vehicles are accurately placed to depict the structure and the extraordinary creation has certainly put Alliance, Nebraska on the map. Another unusual site in Alliance, Nebraska, this very rustic rest area was created with a few stacked hay bales, a toilet, and chair to kick your feet up. The rest stop claims it has free Wi-Fi and makes for a perfectly strange photo opportunity. Severed doll heads, miniature animals, religious memorabilia, and more can be found at the Johnson Museum of the Odd in Lincoln, Nebraska. This bizarre museum is the lifetime collection of Charlie Johnson, a resident of Lincoln, and is run out of his home which is not far from the University of Nebraska. Be sure to call ahead and make sure Charlie is home to welcome you into his shrine of oddities and the unusual. Hebron, Nebraska, is home to the world’s largest porch swing. And while technically not on a porch, the swing has the capacity to hold 18 adults or 24 children, so there’s plenty of room for the whole family to hop on for a photo. It should come as no surprise that the world’s largest plow is located in the state of Nebraska at The Sod House Museum. Thousands of pioneers crossed through the small town of Gothenburg on the Mormon and Oregon Trails and the museum also features a quirky life-size bison made of barbed wire. For an interesting dose of ancient wood and fossils, be sure to visit The Petrified Wood Gallery in Ogallala, Nebraska. For more than 50 years, the Kenfield brothers created sculptures made of petrified wood and their gallery now features dozens various displays of ancient woods, fossils, and local artwork. This quirky attraction dates to 1953, when the Boys Town Stamp Collecting Club started to consolidate their less valuable stamps using a golf ball as a base. The stamp ball project transformed into a giant sphere up until 1955 and still resides in Boys Town where visitors can marvel at the unusual creation. Millions of years of dusty earth have transformed this part of Nebraska into a land of dramatic, fantastical shapes and rock formations known as the Toadstool Geological Park. Visitors can wander along a one-mile trail through the park to view speculator cliffs and out-of-this-world formations. Preserving the history of roller skating, this museum in Lincoln, Nebraska, features the largest collection of historical roller skates in the world. From skating costumes to skating films, a variety of skating memorabilia is on display dating from 1819 to the present day. Want to buy a random family’s cookbook and add it to your own collection of recipes? The Morris Press Cookbook Store in Kearney, Nebraska, is one of the only places in the world that allows you to do so. Morris Press began as a commercial printing business and developed into one of the largest cookbook publishers in the country. It is now an outlet for all the unsold cookbooks they once printed for various organizations. Ole, a world traveler and avid game hunter, has transformed his animal collection into an ever-expanding space called Ole’s Big Game Steakhouse and Lounge in Paxton, Nebraska. This peculiar restaurant slash taxidermy lounge features an elephant, giraffe, and enough exotic animals to attract a crowd. However, if you find the idea of dining in a room of dead animals a bit morbid, this attraction might not be for you. When two men went digging and searching for water in the Oglala National Grasslands, they stumbled upon a monumental discovery. The men unearthed 10,000-year-old remains of up to 600 bison in a site that is now known as the Hudson-Meng Bison Kill. The reason for their death remains a mystery, but a visit to the site allows you to develop your own theories of what might have happened to the bison.